YackPack makes it easy for groups to communicate, using your own voice and an ordinary Mac or PC. YackPack is simple: You just click and talk. No typing required – and no software to install. 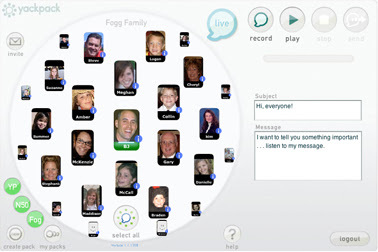 Your group can use YackPack in two ways: Live Voice & Voice Messaging. In both modes the richness of voice helps people communicate easily and clearly, avoiding the misunderstandings caused by email. Talking with your group is easy with Live Voice. You push the “LIVE” button and talk into your computer microphone. Everyone logged in can hear you. When your group members respond, you can see who’s talking. If you stay logged in all day, your group stays connected, allowing you to talk any time. With YackPack you can also send voice messages in three steps: click, talk, and send. The recipients then get an email saying you’ve sent a message. They click on a link to login and listen at their own convenience. You can send messages to one person or everyone in your group at once.